Here you will learn about all types of beach rocks, from very plain to awesome ones like beach agates and other semi-precious beach gems. So, this is the place to start from if you need information on beach stones and smooth rounded pebbles, which many of us are drawn to. You will also learn how to tell natural stones from stone-like solidified sediment. You will find some geological information about the origin of beach stones and pebbles, you will learn how to identify them and you will also get to know how to group them into categories according to their type. Most often sea tumbled rocks look so different on the sand from the same types of rocks and minerals found rough on mountains, mines, quarries or elsewhere. You will realize that they are like all other kinds of rocks that have been created and exist above and under the earth's surface. So, among them you can also find different types of colorful gems, the kind sold in the market (often referred to as birthstones). In the links below, there is information concerning birthstones; you will also be given some tips on how to sort these out from other types of rocks found on the beach and shores. You can apply what you learn in this section to identifying and categorizing not only beach rocks but river rocks and lake rocks too. And if you ever wondered why beach rocks and pebbles have different shapes and textures you will find answers to that as well. 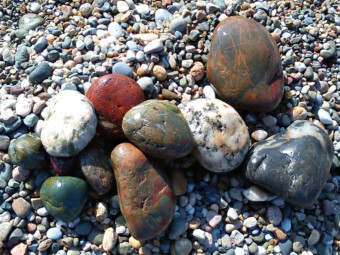 Some interesting facts about beach rocks and beach pebbles. 1. If lightning strikes sand on a beach the heat can turn the sand into a mineral called “fulgurite”, from the latin “fulgur” which means “lightning”. It has the form of a hollow glassy tube, in the shape of the lightning bolt, and is often referred to as “ lightning stone” or “fossilized lightning”. It is not actually a stone, although some people believe fulgurites are “energy” stones which can help you enhance your creativity. 2. It is unlikely to find a precious stone pebble on the beach (e.g. a diamond, a sapphire or a ruby) because these are mined. But you can find semi-precious beach pebbles (e.g. agates) and organic gems (e.g. fossilized corals and amber). 3. If you find a pebble that looks like silver or gold, it is probably mica or pyrite. Pyrite and mica are found in sedimentary and metamorphic rocks. Gabro and Schist pebbles often have mica inclusions. Rusty Quartz pebbles have copper pyrite inclusions, which create a yellow-brown stain often filling a crack in the pebble. Lapis Lazuli also has both mica and pyrite inclusions. 4. Pebbles and beach rocks may contain small petrified body parts of sea creatures (e.g. shells, shark teeth, crab claws) or plants (e.g. corals), or may themselves be part of a fossilized animal (e.g. dinosaur bone) or tree (e.g. petrified palm wood). 5. What, at first glance, looks like a sandstone with an unusual shape and bands of red, yellow, and brown may actually be a valuable piece of ancient or vintage pottery. Use a magnifying glass to examine it very closely. If it contains tiny quartz crystals and tiny grains of different colors in it, it’s a rock and these grains of various colors are different minerals. 6. Meteorites fall everywhere - even on beaches, and very often in the ocean - but strange looking beach rocks may have not fallen from space. It is also unlikely that meteorite fragments, which you may find on beaches and river banks, will be black - most of the times, they have a rusty color (due to oxidation of the iron in them). If it’s not very heavy for its size, or has holes in it, it’s definitely not a meteorite is what geologists tell us. Also, most meteorites attract a magnet but not all. Which means, if you find what you suspect is a meteorite have an expert examine it, or take it to a University Lab or other certified meteorite-testing lab, for identification. Copyright © beachstonesinspired.com All rights reserved.